There is a tendency when presenting Sophocles’ Oedipus Rex (c.429bc), one of the cornerstones of western drama, to emphasize its static monumental beauty. This is the path that Igor Stravinsky and Jean Cocteau took in their musical adaptation of the play in 1927. This is the approach Tyrone Guthrie took in his famous production of the play at Stratford in 1954, recreated by Douglas Campbell in 1997. Daniel Brooks takes an entirely different approach. The great great virtue of his production, despite its various flaws, is to treat Sophocles’ play as great living drama that affects us because of its immediacy and keen insight into humanity. Stratford has previously used the adaptation by W.B. Yeats from 1928. Yeats did not know Greek and relied on other English translations. For the present production Brooks uses the 1988 translation by poet Stephen Berg and classicist Diskin Clay to achieve a greater sense of modernity that is also historically informed with knowledge of the original text. Brooks also completely dispenses with the buskins and full-face masks Stratford used in it last production to present the play in modern dress. Camellia Koo has designed a starkly minimal set all in dark grey. The only furniture on the grey floor are a grey metal desk on wheels and a grey metal desk chair. Ordinary grey metal stacking chairs surround the stage at regular intervals. The only oddity is a square grate just upstage of the desk whence shines a light. This represents, rather inappropriately, the shrine of Apollo, the god of the sun and of reason, who in no way is ever associated with anything subterranean. Costume designer Victoria Wallace has given Oedipus no signs of kingship, ancient or modern. Gord Rand as Oedipus is dressed in a summer jacket and tie looking casual, in fact, compared to what many a Bay Street executive might wear. 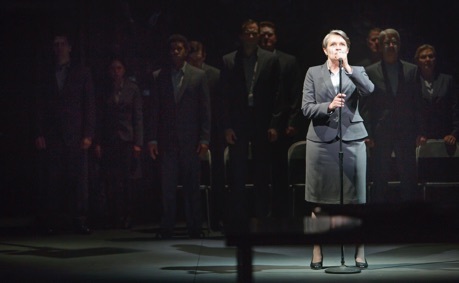 The men of the chorus are dressed in grey suits and the women in conservative grey skirt suits. Only certain individuals who visit Oedipus bring any colour to the stage. Shannon Taylor as the Priest of Apollo wears a bright red habit in the style of a high-ranking Greek Orthodox nun. Yanna MacIntosh as Jocasta wears a bright blue dress on her first appearance. 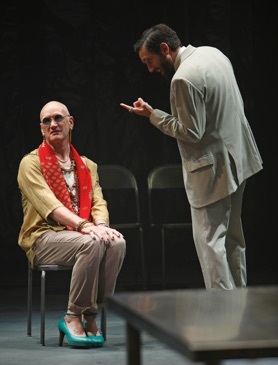 Nigel Bennett as the gender-fluid prophet Tiresias wears earth tones and bright green high heels. Because of all the greyness, the image of Oedipus at the end, all flesh and blood, has even greater impact. Brooks has lighting designer Michael Walton allow the lights to spill from the stage into the first few rows of the audience. Brooks’s concept is that everything we see on stage is being enacted in public before the people of Thebes, whom we represent along with the chorus who give voice to our concerns. Why the chorus leader uses a standing microphone when everyone can be heard in the Tom Patterson Theatre without one is a mystery. Brooks may be trying to underline the chorus leader’s public voice, but such a ploy is unnecessary. Also unnecessary is the opening act of metatheatre when Brooks has the Priest of Apollo take a modern fog machine and go about misting up the stage before Oedipus’ first entrance. These slips aside, Brooks provides a close, visceral reading of the play. Oedipus is not some ancient king of legend but any man who feels secure in his wealth, status, power and worldview. The Priest of Apollo charges Oedipus with the task of discovering why Thebes is being punished with a plague which he dutifully undertakes. He calls in people to help with the investigation, like his brother-in-law Kreon (Christopher Morris), who recommends that Oedipus consult the prophet Tiresias. When Tiresias announces that Oedipus himself is the man he seeks, Oedipus naturally reacts with disbelief and anger and believes that some conspiracy between Kreon and the prophet must be behind such a claim. The turning point comes when Jocasta arrives to calm Oedipus and persuade him not to believe in oracles and prophesies. 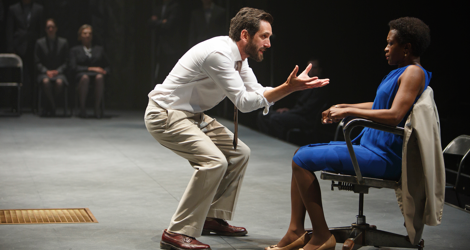 The brilliant twist in the play that Brooks brings out so well on stage is that the very information Jocasta uses as evidence to contradict the validity of oracles is the very same that begins to confirm it in Oedipus’ mind. From this point on Oedipus’ quest becomes a personal quest for the truth at all costs, a sign paradoxically both of what is most noble in Oedipus and of what leads to his destruction. Brooks traces the course of Oedipus’ enquiry with a mixture of high emotion and admirable clarity so that one of the founding stories of Western literature feels absolutely fresh. As a director, however, he tends to encourage too much shouting, even into the mic, to convey emotion when a lowered, highly controlled voice can create just as much intensity, if not more. The appearance at the end of the once-powerful Oedipus, blinded and completely naked, is a forceful image of downfall into ignominy, but it also creates several problems. First of all, we hear that Oedipus blinds himself after seeing that Jocasta has hanged herself. To arrive at the state Brooks shows us, Oedipus has to have removed his shirt, tie, shoes, socks, pants and underwear before blinding himself which thus rather undermines the impetuosity and extreme emotion that should precipitate his action. Second, we see on the backs of Oedipus’ bare thighs what seem to be the scars of his having been bound as a child. The difficulty here is that we have heard quite clearly that the child was bound by a rope that passed between his Achilles tendons and his ankle bones. If we are going to have a naked Oedipus, show us this scar more accurately since it is this that gives the character his name (Οἰδίπους or “Swollen Foot”). Third, Brooks has Oedipus exit to Jocasta’s room via the house right vom but then re-enter blinded from the back of the stage. Why, does he not retrace his steps from Jocasta’s room, especially since he is now blind? Fourth, Brooks directs Rand as if Rand were playing a person born blind rather than as a newly blinded and distraught man. Brooks makes Rand far too accurate in finding the source of voices and in avoiding obstacles in his path. Rand still gives the performance of his career. His Oedipus is disdainful of the Priest and displeased to have to disturb his private comfort to take action even though the people of his realm are dying. This is one part of his hubris. The second part is his lack of restraint in insulting the reluctant Tiresias followed by his further ridicule when Tiresias finally tells him the truth. But later, when the pieces of evidence fall into place piece by piece, Rand conveys Oedipus’ growing obsession with discovering the truth mingled with his growing horror of what that truth is. It may be beyond anyone to play Oedipus’ final scene. We tend not to hear the words but only Rand’s keening howl less like a human being, more like a animal in pain. In an ancient setting, Jocasta’s disregard for oracles can look foolish. in a modern setting it looks more as if she is simply being sensible. This fits perfectly with Yanna MacIntosh’s portrayal of Jocasta as an intelligent woman who wishes to calm her husband’s unreasonable fears. MacIntosh chillingly shows how doubts begin to invade her thoughts the more she hears of Oedipus’ background. When the Messenger (Kevin Bundy) begins his narrative, MacIntosh finally has to sit down with her back to the audience, yet even in that position she conveys the feeling that the Messenger’s words are crushing the very life out of her. Christopher Morris plays Jocasta’s brother Kreon as if with the knowledge of the rigid autocrat Kreon will become in the tragic history of Thebes shown in Sophocles’ Antigone. Morris makes Kreon’s angry defence of himself against Oedipus’ charges of treason so vehement that we already can see why he will become too strict a ruler when the governance of Thebes is thrust upon him. Nigel Bennett radically distinguishes his two roles as the blind seer Tiresias and the unkempt Shepherd. His Tiresias is the more memorable for going completely against the way the august seer is usually portrayed. His Tiresias may appear effete and effeminate but what he says could not be more harsh and to the point. Bennett shows Tiresias disdains Oedipus as much as Oedipus disdains him. The more Oedipus insults him for not revealing what he knows, the more Bennett’s Tiresias’ willingness to spare Oedipus his terrible knowledge wears thin, especially when Tiresias already knows how Oedipus will react. Deidre Gillard-Rowlings gives powerful voice to the Chorus Leader who often shares her role with the equally forceful Brad Hodder. Brooks has decided to emphasize the mercenary side of Kevin Bundy’s Messenger so that Bundy delivers his lines as if always calculating what his knowledge will be worth. Brooks makes the mistake of having the Messenger rob the dead bodies of Thebans while the Chorus speaks both because it is distracting and because it has nothing to do with the plot. Lally Cadeau has the important role as the Servant, more often known as the Nurse, who recounts Jocasta’s death and Oedipus’ self-blinding. Brooks has reimagined the servant as a common charwoman and allows Cadeau to use a bizarre accent that veers between Ireland and Serbia as if trying to make its way to Greece. What the Servant says is so important, better not to impede it with any accent at all. One continual, maddening annoyance is Alexander MacSween’s sound design. A constant drumbeat or the thrum of a bass string accompanies the action from beginning to near the end. It was so distracting I kept praying it would end, but after every choral ode the rhythm merely changed slightly. Only for the final scenes was the beat replaced with the sound of strings. Brooks probably wanted this beat to reinforce the idea of the inexorability of fate. But presenting the play in one intermissionless act already has that function and needs no reinforcement, especially an auditory one that impinges on the spoken word. By bringing Sophocles’ play into the present with such insight and by drawing such powerful performances from the main players, Brooks’s Oedipus Rex could have been a major achievement. Sadly, a wide range of minor misjudgements, all easily correctible, combine to drag the production down from the heights it could have reached. There have been so many fine modern productions of ancient drama (like Katie Mitchell’s magnificent Oresteia) that few theatre-goers are likely anymore to think of ancient drama as bookish or stuffy. Yet, if there are such people, they should be sure to see Brooks’s Oedipus since it so clearly demonstrates why the great plays of the past still speak to us with such undeniable power. Photos: (from top) Gord Rand as Oedipus and Yanna MacIntosh as Jocasta; Deidre Gillard-Rowlings as the Chrus Leader with the Choris; Nigel Bennet as Tiresias and Gord Rand as Oedipus. ©2015 David Hou.